Today, it feels like there are a million different apps, tools, workouts, and eating plans designed to help you lose weight. 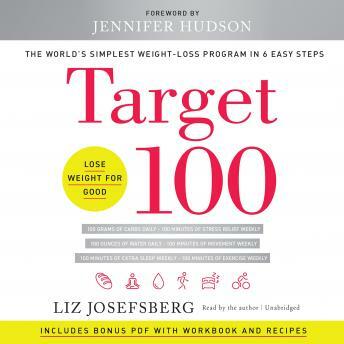 Some promise success via drastic, unlivable restrictions; others are so complex they turn losing weight into a second job.In Target 100, celebrity weight-loss coach Liz Josefsberg shows you don't have to be a slave to your weight-loss program. You don't have to count every gram of every nutrient and every calorie you eat at every meal. Believe it or not, weight loss can be simple.It can even be ... fun.A fifteen-year veteran of the weight-loss industry and who lost-and kept off-sixty-five pounds herself, Liz has accrued a high-profile clientele. She helped Oscar-winner Jennifer Hudson lose weight and transform her life and coached Jessica Simpson to shed over fifty pounds of baby weight (twice!). But along with the likes of Charles Barkley and Katie Couric, Josefsberg has also coached thousands of others, everyone from stay-at-home moms to office jockeys. Along the way, she's learned what works-and what doesn't-when it comes to lasting weight loss, and she's ready to share her secrets with the rest of us.Target 100 streamlines the weight-loss process into six easy-to-follow guidelines and shows you how to adjust them to fit your lifestyle, personalizing the program so that it works for you. Josefsberg offers tips, worksheets, and powerful insights to help you fine-tune a range of weight-related behaviors, from battling stress to getting more sleep, setting the stage for permanent, long-term weight loss.Warm and no-nonsense, encouraging and informative, Target 100 is a holistic and revolutionary wellness book with a simple message: you don't need to be perfect to lose weight, or transform yourself into someone you're not. You can lose weight for good with the world's simplest weight-loss program.